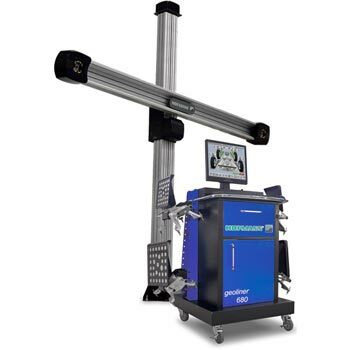 The Hofmann Geoliner 680 Imaging Alignment System is one of the most advanced alignment systems shops can buy. 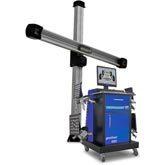 It’s so fast and easy, technicians can go from set-up to readings in less than 2 minutes - 70% faster than conventional alignment methods. This complete measurement system is loaded with our Premium Pro 32 software package that will make alignments the most productive service in any high-volume shop. 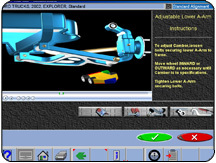 The easy-to-use operator interface walks the user through advanced measurements including front Caster Trail*, Scrub Radius*, SAI and Included Angle measurements. Our patented VODI™ Graphic Display is used with High-Definition (HD) cameras to provide visual and directional assistance to the technician during the alignment measuring procedure. Rolling Radius measurements detect tire diameter differences and prevent damage to vehicles with all-wheel drive and ABS. The Hofmann Geoliner 680 also includes Vehicle Dimensioning Plus, a patented feature that uses 3-Dimensional modeling to measure front and rear setbacks, track widths and cross-diagonals. This time-saving software will alert the technician when possible frame or unibody damage may exist and require corrections before a proper alignment can be performed.